Une architecture traditionnelle, en pierre construite maison totalisant 138 mètres carrés. Il est une maison de deux étages composé de trois chambres spacieuses et WC à l'étage et salon, cuisine et WC, en bas et un WC extérieur .. Le "Vilavala" peut accueillir 6 à 8 personnes. La maison est entourée par de grandes vérandas extérieures, à différents niveaux, de plus de 200 mètres carrés. Il est construit sur la rive de l'une des baies les plus merveilleuses de Alonnisos avec bleu et turquoise propres et cristal mer claires. Il est situé au milieu des pins (Pinus halepensis), trois, d'oliviers et soignés végétation méditerranéenne originale. Depuis la villa est construite sur une grande oliveraie où la seule autre maison est à une certaine distance de sa position isolée garantit une totale intimité aux résidents. Le paysage environnant donne le sentiment de tranquillité intérieure tandis que les points de vue sur les eaux bleues ci-dessous étendent tout le chemin aux «portes» du parc marin (protégé, pour le phoque moine, région). Téléphone uniquement pour les appels locaux. lumières de sortie. nids d'incendie. Vila Vala is amazing! And Yannis' hospitality is over-the-top! Thank you! The ultimate traditional Greek experience! We were greeted immediately at the ferry by our host Yannis who drove us to his family home. He is a wealth of local knowledge about Greece, Alonnissos and the Marine Park. 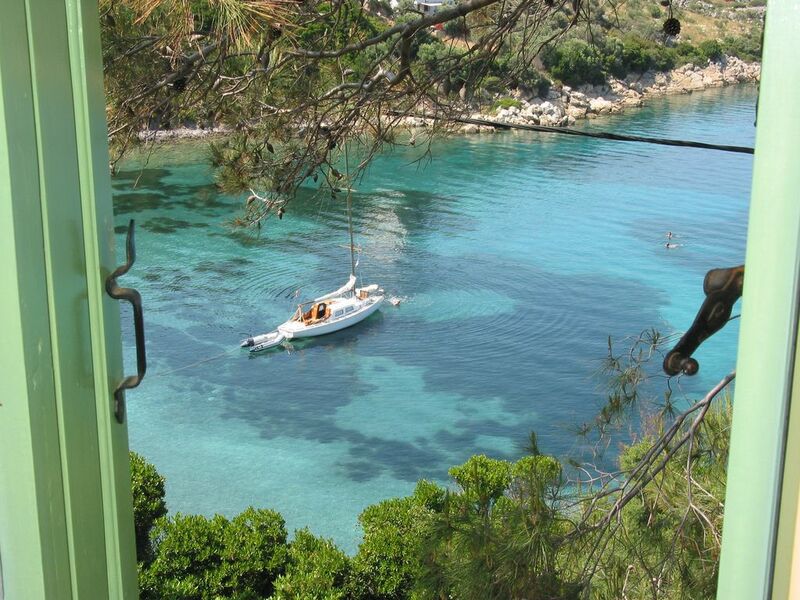 Vila Vala sits on its own private peninsula and overlooks the clear blue water of the Aegean. You are steps away from swimming, snorkeling and kayaking (kayak onsite!) And a short 10 minute walk to Steni Vala town. Vila Vala is a museum of Yannis' family history and very well appointed with everything you would need for a peaceful relaxing holiday. My wife and I cooked dinner and sat out on the patio watching the fishing boats come into Steni Vala. As an extraordinary example of Greek hospitality, Yannis personally took us on a boat tour of the nearby islands telling us the history of this beautiful place where he and his family grew up. We even stopped at a quiet remote beach for a swim in the refreshing waters of the Aegean. We will not soon forget our amazing holiday in Alonnissos with Yannis at Vila Vala. We are already looking forward to our next visit. We had a wonderful stay at this authentic Alonnisos house full of history, antiques and charm. The location is amazing, peaceful with stunning views and complete privacy. The kayaks were a big hit with the kids and we loved paddling over to Steni Vala (15 mins away) for lunch and shopping. Our host, Yannis, was very attentive and went above and beyond to ensure we had a pleasant stay. There was a ferry strike on the day we left and Yannis went to great lengths pulling strings to make sure we made our flight - he couldn't have been more helpful! We hope to be back soon. Vila vala is perfectly located, in a very preserved and quiet environnement, surrounded by pine trees with an amazing see view and direct access to the beach while still being 10 mn walking distance to the small port of Steni Vala. The house is perfect for holidays : very nice, easy to use, direct access to the sea, large terrace, natural shade and it is also a very charming and authentic house with a lot of antiques and personal touch. Yannis is an amazing host, he lives up very high the tradition of Greek hospitality and he helped us so much during our entire stay. We will definilty come back to Vila Vala. Again a big thank you to Yannis. A week to remember forever.. spectacular location, nearly private bay.. the views.. the sounds.. the smells.. Greece at its best. A unique home, fully equipped, that takes you back in time with everything that is in it.. the paintings, the rugs, the handcrafted wooden details, the old office, the books.. An intelligent, helpful and discrete owner. I can't tell if it was because of the natural landscape or the vibes of the house.. but our energy levels were the highest. We all left with the best memories and the promise to return one day. We have stayed in Vila Vala many times, I could not contemplate staying anywhere else. it's like coming home and we are always excited to arrive knowing we will have a wonderful holiday and be welcomed by Yannis in the same way as we were the first time, with affection, attentiveness and in the knowledge that we will want for nothing...except perhaps that our return fight be cancelled so we can stay another week!!! We count the days till our next stay when we will once again smell the pines, see the near and distant beautiful views, swim in the clear turquoise sea where the fishes are so numerous, it's like swimming in an aquarium and have the company of Yannis who makes our stay perfect. Perfect villa in an idyllic location! We have recently returned from a two week stay at Vilavala. We are returning guests, as I believe many guests are, and this is testimony to the beautiful location, well equipped, comfortable villa and the exceptional hospitality of the owner Yannis. The villa is built overlooking the pretty, secluded bay of Agios Petros, with almost uninterrupted views out to sea, across to the National Marine Park. It is possible to watch dolphins and, if you are lucky, the monk seal, from the comfort of your chair. There are a number of terraces, each with either sun or shade throughout the day, some on which you can enjoy a martini or g & t in the very pleasant evening sun. The spacious house was spotlessly clean on arrival and is very well equipped. But the real jewel in this particular crown is the owner Yannis. Even before we arrived he was able to provide very helpful advice regarding the ferry timetable. He met us at the port and drove us to the villa, and throughout our stay he was available, unobtrusively, should we have needed anything. Yannis is a perfect host. I can not recommend this property highly enough, in my opinion it is perfect and anyone lucky enough to find it will be captivated by the beauty and peacefulness of its surroundings, and like us, will be drawn back many times. We have already booked next year! Thanks Paulene for your so nice review!! I am really... wondering.. if I really am as you describe me.... Any way I am so thankful to you as you, every year, start the "summer season" with the best way and you feel Vilavala as your home. Nice to hear that you have arrived well back home and I am waiting you next summer. Agios Petros est une belle plage isolée à côté de Steni Vala avec invitant fond de sable parsemée de colonies de Poseidonia herbes marines. Le village le plus proche est Steni Vala (seulement 500 m), tandis que le port de Patitiri est à 8 km. Originaire de la vallée d'Agios Petros était une zone agricole, le domaine de deux familles Alonnisos, qui a patiemment travaillé les oliviers de plantation des terres sur les pentes et les vignes, orangers et de citronniers dans la plaine. Le passé agricole de Agios Petros reste toujours sa caractéristique prédominante que les propriétaires de la villa sont allés dans de grandes douleurs ne pas détruire, même un seul arbre, dans certains cas, ils ont même enrichi les variétés existantes par la plantation de plus. Dans la vallée d'Agios Petros, il existait deux puits privés pour les besoins des familles privées ou agricoles. Un troisième «bien public» a été déterré près de la plage pour l'utilisation des Sheppards des hameaux voisins de ISOMATA, Gouves et Steni Vala.